When Albert reached school age he went to one-room schools and had many stories to tell of the strict teachers and ornery boys, some of which were really too old to be there but wanted to go to school for the sole purpose of teasing the younger kids and annoying the teacher. The teachers in those days had a hard job, having to do all the custodial work, including building fires in the stove every morning. The teachers boarded with families in the community including the Stolz family. Albert completed the seventh grade in school, then went to work on the family farm. In his eighties he could still recall word-for-word the poems and stories he learned in his youth. He enjoyed singing hymns and ballads with his sister, Alice. 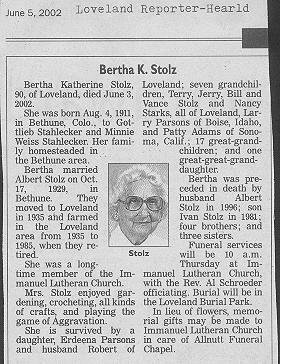 On October 29, l929 he married Bertha Stahlecker. More on Stahlecker relatives at Nathan Kramer web site ( http://www.nathankramer.com/settle/tree/stahl.htm ) They lived on his family farm in Bethune at first--his father had passed away some time before so they shared the big house with his mother. But these were days of the Great Depression and the Dust Bowl on the Great Plains and times were tough. Erdeena was born October 4, l930, and Ivan was born on March 7, l934. Albert and Bertha decided to move away from the blinding dust storms in l934. Bertha was allergic to the dust and was covered with eczema. They came to Loveland in the northern part of the state and found conditions much better. They were not able to get a farm right away, so we lived in town for a time. Albert worked at whatever job he could get. One of the jobs was working for the government WPA projects. He and a crew of men dug the entire basement of the Loveland Community Building (now called the Pulliam Building) with shovels. After a time they rented a series of farms around Loveland and Ft. Collins. Albert found the work on an irrigated farm to be different and difficult from the dry-land farming he was used to in Eastern Colorado. They bought a farm north of Loveland in l943 and worked hard to fix it up and raise good crops. They made it a big success with hard work and perseverance. They milked cows, raised chickens and hogs, and grew many crops, including sugar beets, on their 80 acre farm. Raising sugar beets was very hand-labor intensive in those days--and we, as a family, worked the fields. One person would hoe out some of the beet seedlings in the row leaving a clump of seedlings which the person, crawling on the ground behind, would have to thin out leaving only one seedling in the clump. At harvest time the beets were plowed out of the ground, but then a person had to follow with a hooked knife, pick up the beet with the hook, cut off the tops, and toss into piles. Loveland had a big sugar beet factory. Albert worked one season in this factory where the beets were cooked and refined. It was a hot, smelly job. They always had a big garden and canned lots of fruits and vegetables. These were kept in a dug-out cellar for coolness. Albert loved to tease the grand-children by telling them that a "boogie man" lived down there. One day Albert was chasing the big bull to get him back into the pen when the bull happened to step on an old fork handle lying on the ground. This fork handle flew up and hit Albert in the shin and broke his leg. The bull got the better of that chase! They built a new house on the place in l969 and rented out the old house. They lived there until l985 when they moved into a condo in Loveland. They lived in the condo for 11 years and celebrated 66 years of married life before Albert passed away at the age of 91 on January 20, l996 leaving us with many happy memories. Written by daughter, Erdeena Parsons.